How many Santa Cruz have you owned? 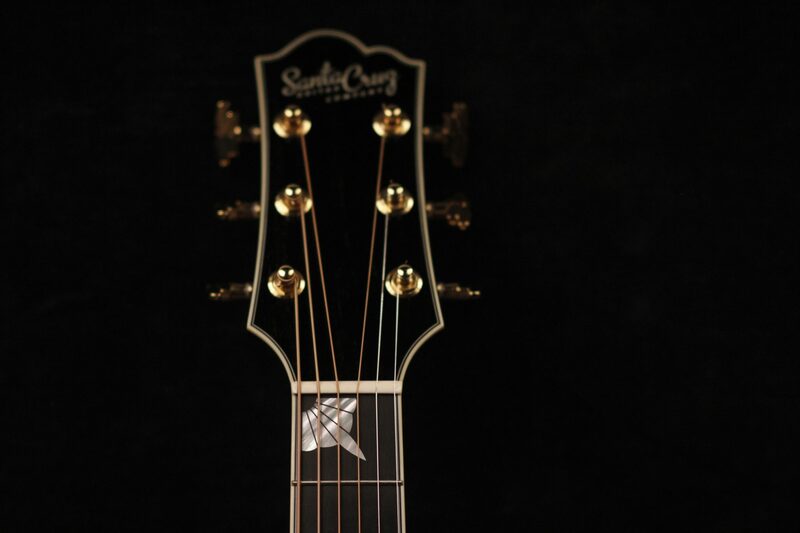 Welcome to SCGC Players Forum › Forums › A General Discussion › How many Santa Cruz have you owned? This topic contains 28 replies, has 16 voices, and was last updated by sdelsolray 4 months, 2 weeks ago. when my right shoulder went south, I decided I should have an OM. I went to Steve Swan and played the least expensive one in the shop. It was Adirondack and Plain Jane Mahogany. It had sparkle on top and rumble on the bottom. I told him to get me a blindfold so I could play all six of the OMs he had in stock. After about 20 minutes, I decided on the one that sounded best and felt right: it was the one I had started with. I rejected Brazilian and German Spruce, Brazilian and Adirondack, Indian Rosewood and Sitka, Mahogany and Sitka, one other, and went home with a $3200 brand new guitar. I traded in a shop worn 12 fret Dread I bought at a reduced price. I also had a shop worn Dread that had the bridge lifting. Steve sold it for me for about $1400 as I recall. later on I got a Firefly which I sold to help pay for college for my son. i have had five SCGC guitars. I miss the OM and Firefly. I’ve owned 3. I owned a beautiful Mahogany/Sitka H13, but never quite connected with it and sold it after a couple of years. I own a terrific EIR/Euro OM and an outstanding Coco/Euro OMG. I love these guitars – amazing! I just bought a Karura flight case for the OM to replace the monster Armitage case. This reply was modified 6 months, 3 weeks ago by haasome. Six. My current Remuda( the DA-1 is for sale) and a beautiful F Ziracote/German that I should never have let go. I bought it from a wonderful lady who was on the “old” Forum. Which brings up a question…when this edition of the Forum got going we could list our Herd(and I did)….then it dissapeared.Can we still list them? When you sign in, look for profile in the upper bar, click that and then click Edit on the left sidebar, that will take you to your information where your signature information is, don’t know where it went but it’s still there. 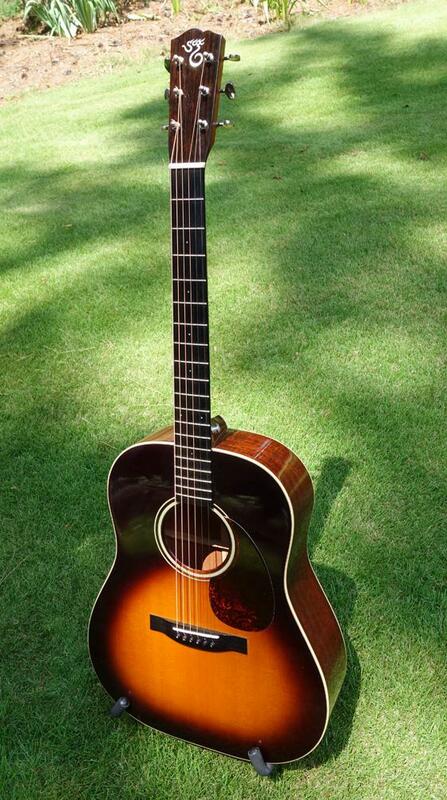 Just the one 1942 Bluegrass D from Steve Swan in early 2002. Still have it. Will never sell it. This reply was modified 6 months, 3 weeks ago by Daniel. Four-one currently. First one was the motivator to get back into guitar after 30+ years off. It was an OM Adi/Hog cutaway. Second was a 000 1929 that my wife wanted. Third was an OM with Italian Spruce/Fiddleback Hog with 1929 appointments. All three were wonderful guitars and the buyers were thrilled to get them. Fourth is my Vintage Southerner that I ordered custom and picked up a few weeks ago. The main custom feature that makes this one a keeper for me is the spacing-1-3/4 & 2-5/16″. I am really happy with the wider bridge spacing and could never quite relax on SCGC’s std spacing or even the 2-1/4″ that my two OMs had. I have a few Martins with 2-5/16″ so I’m happy that all my favorites have that spacing and my new VS is an instant adder to my faves. Three for me. I still have two of them. My first encounter with SCGC guitars was a used one in Guitar Center. I think it was an OM. I didn’t think it was very good. That particular one was probably abused, maybe over-humidified, or under-humidified. It was kinda dead sounding. I’d heard good things about the brand so I didn’t let that impact my judgement, but it was my first experience with the brand. I eventually ran into a second one at Guitar Center and that one was much better but it was the wrong guitar at the wrong time for me so I didn’t buy it. Then I wandered into Sylvan Music in Santa Cruz and played every SCGC they had and really liked a 00 EIR/Sitka they had. It was the best sounding guitar I had ever played. It had soul, it was vibrant, and it was easy to play (best neck I’d ever hand in my hand). I didn’t buy it that day because I hadn’t brought enough funds and lost out as someone else did, and it was only a week later that I went back to buy it. I left depressed. Some weeks later I found a 00 Adi/Hog on Ebay and won the auction. It came with worn out frets and I think 10s on it. It didn’t sound great, but somehow I could sense it had a lot of potential. I was upset about the bad frets but decided to get it fixed instead of challenging the seller about it. I got stainless steel frets put on it and I carved a new saddle out of bone and put that in (the old one was badly chipped). What I got was, and is still, better even than the 00 I first played. It’s gorgeous in looks and sound and so easy to play. Why can’t all guitars be this easy? But I still wanted one that was rosewood-backed. I love rosewood. Had to have one. I found a 00 EIR/Sitka with a slew of upgrades in Wisconsin but it was $6200 and I decided to wait for something to show up elsewhere for a bit less money. One never did (SCGC 00s don’t come around often on the used market) so I went back to Sylvan and bought a 00 Skye (yes, I know it’s just as pricey as the one I mentioned I didn’t buy, I had a moment of weakness that day). But, the the wide nut width eventually drove me to sell it, that and the fact that Cocobolo, while a superb tone wood, didn’t quite scratch the rosewood itch for me: I had to have rosewood. A few weeks after I sold the Skye (to a super nice guy back east who adores it) a 00 in EIR/Sitka showed up on Reverb with all kinds of upgrades. Turns out it was the $6200 guitar I had seen months ago, having been sold as part of a lot to a guy who was liquidating them as NOS (no warranty). It was selling for far less money this time. I made an offer for even less and it was accepted. It’s on my wall and I adore it. Both of my 00s have the wider 2 1/4 bridges, beautiful rosettes, upgrading binding, hide-glue Adi braces and the non-slotted headstocks: I do not like slotted headstocks. I do not understand or appreciate their attraction. They were each made in 2014 and 2015 and, as it turns out, were both custom orders to the same shop in Wisconsin, who always does custom orders (well, not any more it seems) with specs that happen to be just what I like best. This reply was modified 6 months, 3 weeks ago by Frozen Rat. A D12 I regret selling everyday of my life and my new OM SS SS! Life is good. 15. YIKES ; 00R. 00K. 2 H13. 2 DPW R&M. 1DCOCO. 1D12. 1 TR. 1VJ. 2 OMPW. 1 H. 1 D12X12. AND …………. Finally my D Law. One leading to another. May this beautiful dream continue. 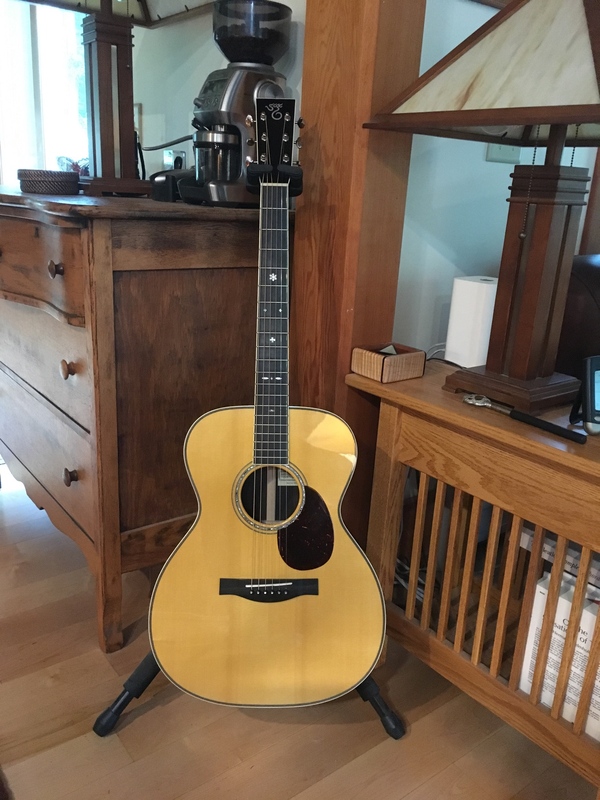 When my old (1950s) Martin 0-18 finally went the way of the dodo – long story involving a former owner who’d essentially loved it to death – I started to look for something new. The 14-fret 0 had been nice, sounded good, and such, but it seemed like OMs or other slightly-larger-but-smaller-than-dread size guitars had more versatility, so I started checking them out wherever possible. In the process, I came in contact with instruments by a lot of builders. At Steve Swan’s, when he was still in Kensington, I tried one after the other including some fabulous new SCGCs, until he put a battered 7-year-old used instrument – an OM cutaway – in my lap. That one got my attention. Despite lots of evidence of heavy play, it felt great and sounded sublime. After going back and playing it a couple more times, I bought it, and that was that. It’s been my go-to for a little over twenty years now. Sounds good every which way – acoustic, plugged in, miced, whatever. When i turned 50, DW wanted to do something special, so she suggested I see what Richard could make from a piece of Cuban mahogany I’d had for thirty years that hadn’t been turned into furniture yet. That became a 00-29 with some custom features that’s a sweet short-scale instrument with a big voice. Only regret is not diving deeper when I first encountered SCGC. And there are some custom ideas I may explore someday if SCGC is amenable…. This reply was modified 6 months, 2 weeks ago by Matt Hayden. My first was a 2003 Tony Rice, was my main guitar for 6yrs. After I retired I had much more time for playing and my playing style evolved. I felt I needed a tad less bass and more brightness in the mids and moved to mostly mahogany. Second was a 2006 VS, what ever reason I just never bonded and traded it with a friend. Currently I have a 2001 VJ, best sounding/playing D18 type guitar I’ve ever given a go. While the VJ is not ‘vintage’, it is played-in. New guitars are great fun but played-in works best for me at 72. The 2001 has 1 3/4″ nut, full scale and I’m using EJ24’s True Meds. Love this guitar. I’ll make some room in the old corral if you want to ship a few to the Gulf Coast….I’ll curry them and exercise them and let them mix with my Ramuda. Tad if you still have the OM cutaway I sold you a couple years back you can store it at my house for a while cuz I wouldn’t mind playing it again. I could make room. While you’re at it. Send those two little tube amps too! I’ll get everything boxed up. The headstock on the 000 is Braz, but the rest of it can come along just fine. Send me your address and I’ll get them out to you :). I guess you’ll need to put the Mauel on the band saw and whack off that headstock overlay, then. Shame. I like it. Oh well! This reply was modified 5 months, 3 weeks ago by Daniel. I’ve owned 4 in the past and still own a Custom D/PW with Adi top, braces and hot hide glue that is just a awesome gutar. Currently looking to try a H13. Welcome Bigshoe! Glad you found us and can deal with our Vintage Technology, pull up a chair, it’s a fantastic group! Bought my first one a few months ago, an OM/PW. 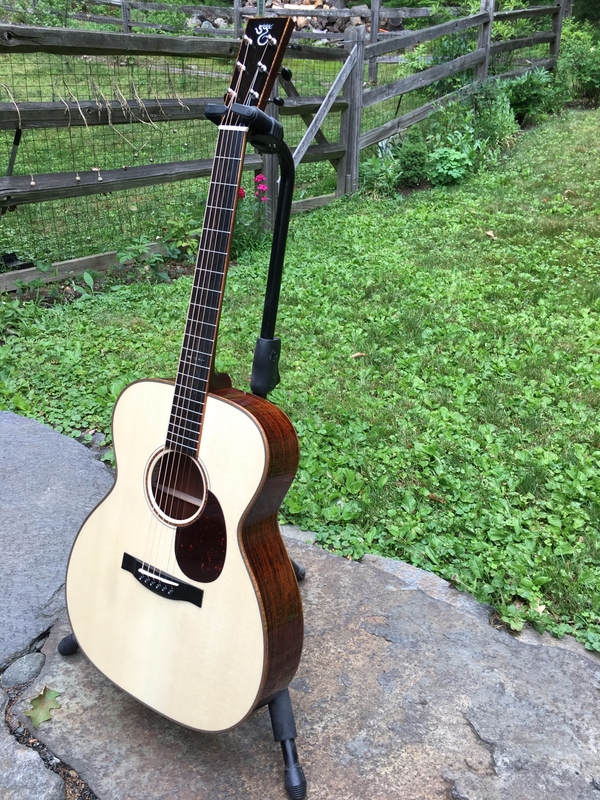 Traded in a nice Martin OM28 because the SC was noticeable tonally superior and just a beautiful guitar to play (nothing against Martin, I have others and like them very much). Like it so much I just ordered a new 1929 OO with a 1 13/16 nut, due to be delivered in early March. Have owned Martins, Taylors, and a Yamaha over the years but have never taken the plunge for a high end instrument. Tried out several, including Beorgoise, Collings, and an older Gurian, which was built in the town I live. The SC spoke to me in a way the others didn’t. Hard to explain…but if you’re on this forum, you know. I have all four that I’ve owned, though it’s only been 16 months since my first one, an F in African BW and Moon Spruce. I fell hard and added two more F’s and a 000-12! I’ve always liked SC’s from the first time I played one around 2000, the light build and musicality, but did not get on with the big V necks. I found a used F that had been ridden very hard and put away wet that sound great and played wonderfully, but the entire finish was cracked and the store was not dealing on the price; it did not last long as I dithered. Anyway, I’m late to the party but am greatly enjoying the experience. Quake 17….Man you jumped into the ole SCGC pool with both feet. excellent selection of models. Welcome to both you and RetiredFire ……We look forward to you posts about your guitars. Six – one currently (a 2017 1929 00 full sunburst). Previously, (i) 1996 F German Maple/German spruce blinged, (ii) 2009 1929 00 (stock specs – I like the modified V-necks of the newer 1929’s better), (iii) 2011 1929 000 (stock specs), (iv) 2011 FS (stock specs) and (v) 2013 F Custom (figured mahogany top, back and sides, full sunburst, HHG, Adi braces). This reply was modified 4 months, 2 weeks ago by sdelsolray.